DC’s very own music festival is coming! 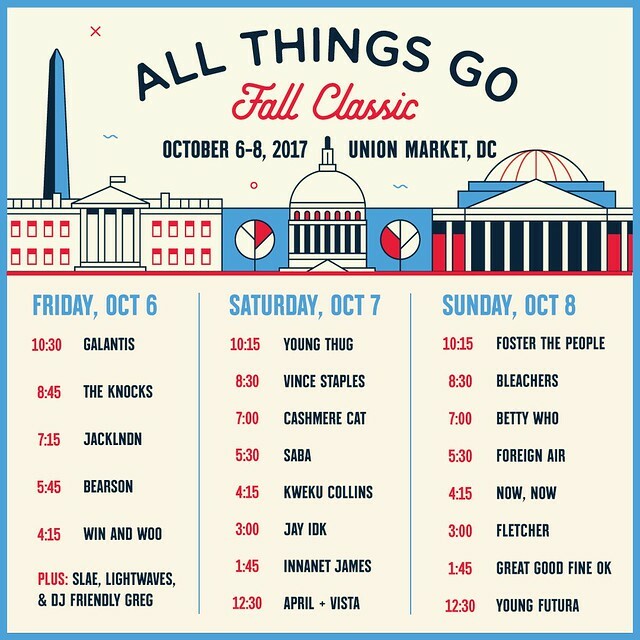 The All Things Go Fall Classic returns in 2017, this time bigger and better. Set at Union Market, this year’s festival is three full days of music on the Friday, Saturday and Sunday (October 6-8). Every day has good music (you can see the lineup and times in the image), but Sunday’s is the best looking lineup from my perspective. Foster the People will headline that day (whom I have not yet seen live), along with Bleachers and Betty Who. Foster the People just released their third album, Sacred Hearts Club, while Bleachers also released their second official album, Gone Now, which I still need to check out. The festival also features food, especially from Takorean, &pizza and Buredo (sushi burritos) – I’m curious to try before the brick and mortar location opens on H Street. There will be t-shirts and other merch available for purchase (VIP ticket holders get a merch bag and some free food samples). It all comes down to the music, and although I’m looking forward to Sunday’s lineup, you also have Galantis and The Knocks on Friday, and Vince Staples on Saturday, along with plenty of undercard bands to discover!